I attended the Actian's Big Data roundtable earlier this week. I was thrilled to be sitting next to Terry Garnett (far left) from Garnett & Helfrich Capital, a very savvy buyout firm that has managed to carve out some great companies from inside larger organizations. 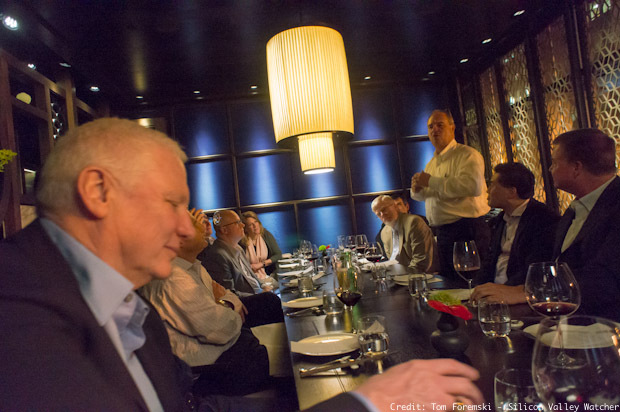 - Garnett is an investor in Actian, a "Big Data 2.0" firm, that was hosting the dinner. I mentioned that, "2.0" doesn't work, that it is too dated, too 2006. It's an understandable attempt to get beyond the "Big Data" term. I've proposed "All Data." An All Data enterprise is a business that analyzes more than just the 10% or so of its data, as most businesses do, according to Roman Stanek, CEO of GoodData. - Big data and the cloud will require new business processes. They will have to be far more agile than the ones currently used and so far, there are no good tools for such enterprise application development. - Today's data sets are different and include mobile and geo-location data. The way databases are used will have to change. - The enterprise IT sector is due for significant changes in order to take advantage of Big Data tools and applications. - Retailers are finding interesting connections. One retailer now runs a special algorithm when a big storm is coming. It knows to stock sheetrock and bottled water. - I was astounded at some of the common sense connections retailers are finding, according to Actian's executives. They could just call me up. But apparently, companies can't see the trees for the forest, and need software to help them analyze their data. They'll discover Christmas day next, and save a fortune by not having to staff their stores for one day.